If you or someone you know is getting ready to say “I Do,” head to the 10th Annual Spring Bridal Fair in the beautiful Oceanfront Arena at the Wildwoods Convention Center on Sunday, March 18 from noon - 4 p.m. The Wildwoods Spring Bridal Fair, the largest Bridal Fair in Southern New Jersey, will feature wedding venues, florists, bakeries, caterers, salons, spas, transportation companies, honeymoon destinations, DJs, photographers, videographers, bachelor/bachelorette party services, the latest bridal fashions and formal wear, and much more. In addition, the Bridal Fair will provide menu samplings from the Convention Center’s executive chef Mike Zaccaria as well as elegant wedding tabletop displays. FREE door prize drawings will take place throughout the day and couples can also participate in fun contests to win great prizes. Admission to the Bridal Fair is FREE, and all registered brides will receive a FREE gift. To register or for additional information, visit www.WildwoodsNJ.com/BridalFair or call 609-465-7181. To be a vendor at the show, please contact Brigitta Scott at 609-465-7181 or visit www.CapeMayCountyChamber.com. 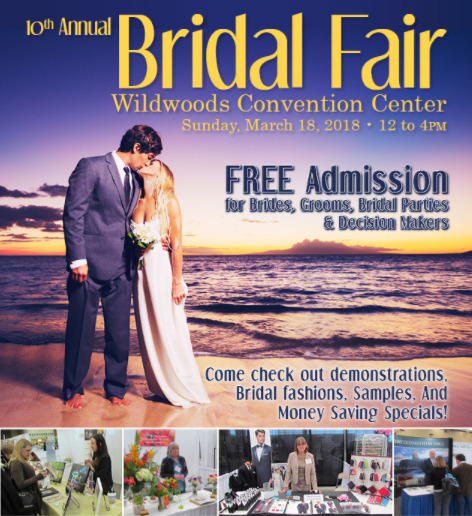 The 10th Annual Spring Bridal Fair is presented by the Wildwoods Convention Center and the Cape May County Chamber of Commerce. Sponsors include TheKnot.com, NJWedding.com, Jersey Shore Wedding Association, the Cape May County Herald, Cuba Libre Restaurant & Rum Bar, and Men’s Warehouse.